The multi-level central dome is framed with steel and clad in glazed glass panels that permit sunlight all year round. Although the greenhouse effect promotes natural heating, certain measures – such as landscaping and tilted louvers – ensure that the heat is bearable during the summer time. It will also have plenty of ventilation. 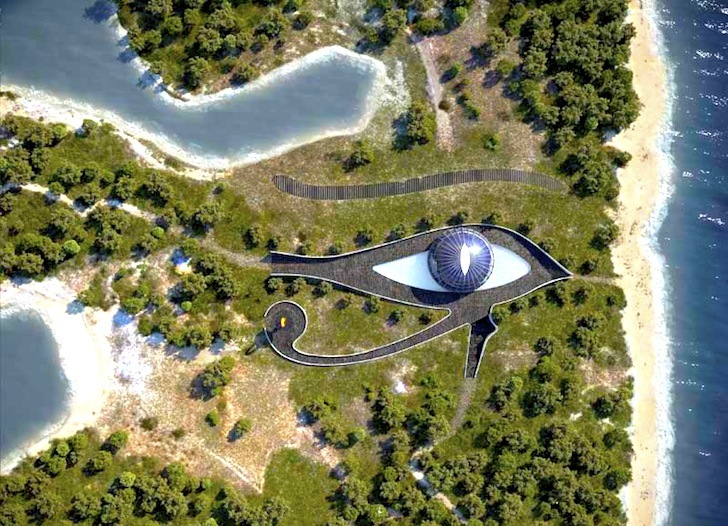 Combined with the photovoltaic panels that make up the property’s Eye of Horus shape, a state-of-the-art geothermal system provides all of the energy this 25 bedroom home (complete with five lounges) could possibly need. Rainwater is harvested, and an on-site biological system treats wastewater. Inside, the house is a landscaped terrace, from which it is possible to take in the incredible views. CORRECTION: This article originally referenced this design in correlation to Naomi Campbell, however further research shows that no such connection exists. Can this same design be constructred with advanced materials that are fire, hurricane, bug and flood proof? Is this house already built ? gracias por permitir apreciar las tendencias actuales en la arquitectura y el diseño mundial asi mismo excelentes los proyectos mostrados . Excelent teacher of te enbiroment and sistem armónica live . Best I can tell it doesn’t have 25-bedrooms, maybe 25-rooms depending on what you count as a room. By my count it is 13-bedrooms, 14-baths, 2-halfbaths, 2-dining areas, living area, family area, game area, theater, kitchen/breakfast area, sunroom, and exercise room. It would make a nice tropical bed and breakfast, just a thought. I just saw this picts, I think you should think about real sustainablility because this is a clear example of cheap "eco" soo "In"; all this is not green!! with such an amount of materials you could make 20 houses for normal people. and more, why you make a house for a wealthy person who doesn't need it? is this eco? Looks like McDonalds of the future. Ë veramente interessante. Sicuramente in un prossimo futuro queste tecnologie si applicheranno giá non solo a ville lussuose, ma anche alle case dei comuni mortali !! That's a mean p***y, to make a man build a house like that! I think it is lovely that she has had such an exquisite ëco-friendly"house built. But truly where is awareness of environmental footprint when one builds such a house to begin with. Conspicuous consumption doesn't count as being eco-friendly. La vivienda es genial, cada detalle pensado e incorporado con mucho estilo y buen gusto! Increíble!!! Love the house, location and the whole idea. My only problem is the recipient. She assaults her staff, sleeps with a married man and generally acts like a completely self-absorbed, stuck-up b*tch her entire life, and she is rewarded with a gorgeous eco-friendly home, free of charge? Not even a bit fair. It is absolutely stunning!!!! I would have enjoyed seeing inside photos too. Congratulations and extremely well done. This is such a beautiful blending of artistic theme, architecture and eco-sensibility. I am glad to give it 5 stars AND two thumbs up. It's nice to know that the celebrity elite are making preparations for the apocalypse. It's equally interesting/stupid that people in general are making plans as to what they intend to do once everyone else is dead. Many analysts or "experts" often predict certain types of future disasters by the year 20-- something. The reason is simple, many of these experts are past middle age, so they figure they'll be dead by then so they won't have to owe up. But just about every single segment in society and the planet has improved drastically. Modern environmentalism is thoroughly polluted by doomsayers and conspiracy nuts. The pollution that came out of cars is far less than what came out of the horses at the turn of the 20th century. They produced manure that polluted the water, the street and the ground. Even with newer sources of air pollution the air overall is getting cleaner. Go back 60 years ago almost every major city had huge plumes of smog. Since then every major pollutant is down dramatically and water quality has improved dramatically. People still joke about the quality of rivers in cities like the East and Hudson rivers of New York. But the rivers of Manhattan thanks to treatment plants are 98 percent cleaner than 30 years ago. You can now swim in the East river. Plenty of fish in the river too that people eat. Every generation complains that things are getting worse when quite the contrary things are improving in every single objective standard; Health, safety, hygiene, employment, quality, leisure time, recreation. A survey of climatologists (the folks with actual expertise), about half of them doubted whether global warming was actually taking place, and many of the rest thought that any warming would be quite small so sea level rise is anticipated to be rather negligible. Even so a slight warming would make it easier to grow food on the Canadian prairie or Russian taiga and increase humidity in the Western United States to improve agriculture. It's well-established that global temperatures rise and fall in cycles lasting hundreds and thousands of years. World temperatures have risen slightly in the last 500 years. Almost all of that increase had took place before the 19th century, before the industrial revolution, the time when fossil fuel burning began to increase rapidly. The world's best climatologists using the most advanced computers cannot predict temperatures 90 days in the future let alone 90 years in the future. Our chemical phobia has been touted by environmentalists as a serious threat and that all Americans live in peril. No one ever bothers to point out how chemicals have helped mankind over the years. Why corporations and economic activity are always made to take the blame, I'm not sure. I assume it's because corporations have money, and are therefore a good target to go after. Did you know there is a chemical in celery called 8-MOP (8-Methoxysauriline) which is carcinogenic in rodent metabolism, and another chemical in broccoli as well but it's harmless in humans because it's not the chemical it's the dosage. That was the problem with DDT, we sprayed too much but it only takes a tiny amount to keep mosquitoes at bay. It's a very effective and dirt cheap way of preventing malaria, it did cause some harm to birds but the birds have largely recovered. Environmentalists made a lot of hype and after the ban by the 1970's led to a massive spike in malaria leaving 50-100 million dead, mostly children. After all if it's "chemical" it must be bad. Hello. Sedir Adasi island is shaped like a plateau with an average height of 3 meters. And the house is located 13 meters above sea level. Although all of the ice cover of the planet, the island will continue to exist, and also this special house. well with rising sea levels, i doubt this home will be a fortess of safety since it will be underwater. just a thought. And Luis de Garrido, our favorite new architect, ran with it! The home is situated on the Isla Playa de Cleopatra in Turkey. 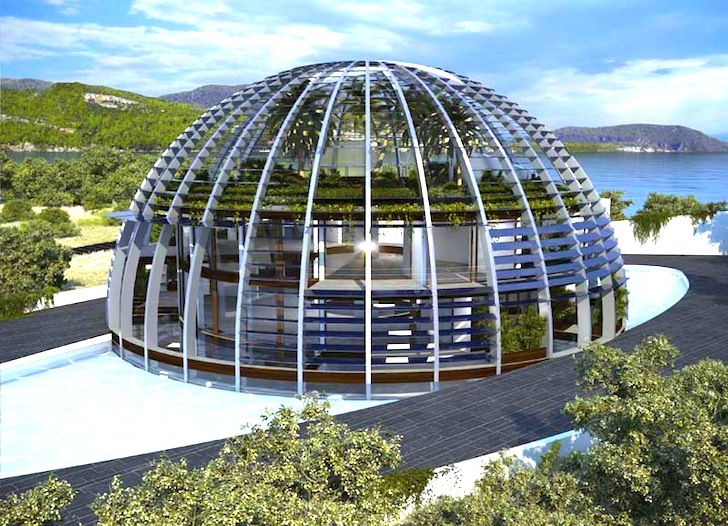 The multi-level central dome is framed with steel and clad in glazed glass panels that permit sunlight all year round. Notice how the designer strikes an incredible balance between natural lighting and heating. Although the greenhouse effect promotes natural heating, certain measures - such as landscaping and tilted louvers - ensure that the heat is bearable during the summer time. It will also have plenty of ventilation.